Those who seek a highly talented crew with which to procure all manner of digital materials for marketing can confidently look to the trusted name of Huemor Designs. From offices in Farmingdale, NY, this bunch of fun loving, deadline smashing talents goes after every client's goals with gusto. This team features such skills as the ability to brand, build creative, bring incredible sites and apps to life, implement effective ecommerce tools, optimize sites for search engines and set up and manage pay per click accounts. Indeed, many clients have come to Huemor Designs for many services. Brands like NBC Sports, Alliant Insight and American Crew have looked to Huemor Designs for professional digital creative services. 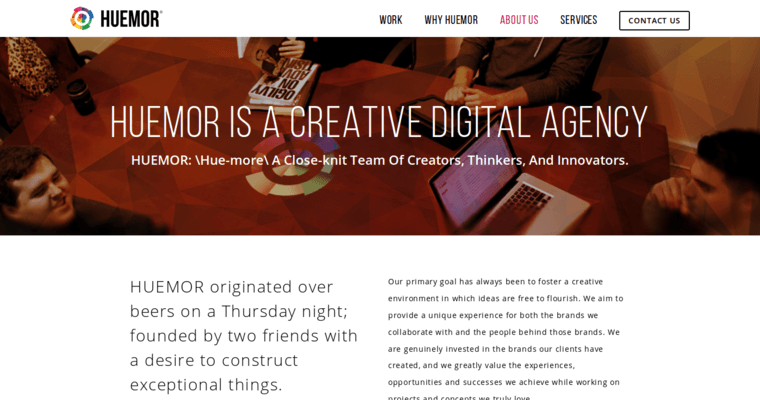 Huemor Designs is a "go to" agency, and any brand could confidently rely upon this team of exceptional talents to knock the cover off the ball every time.